Snack Girl doesn’t cover drinks very often because 20% of her audience is under 21. Yes, I am popular with the young people. To those dear readers I say - today is not for you. “Shut up. No, you shut up! I said shut up! !” He didn’t have to take them to the bus stop. Now, THAT cracked me up because after 5 ounces of vodka my partner would be lying on the floor. This is one of those iconic drinks that isn’t that bad for you. It has tomato juice which has vitamin C and lycopene, and some celery. You can always make it “virgin” and you will cut out 67 calories. I ALWAYS add too much Tabasco and then have to add more tomato juice. Do you make your own mixed drinks? Do you have ideas for lightening them up? Mix vodka, juice, Worcestershire, Tabasco, and lemon juice in a medium sized glass. Load a large glass with lots of ice cubes (5-7). Pour drink over ice cubes and stir with celery stalk. Add some horseradish and Old Bay. Forget the tobasco. Go easy on the old bay - it has a ton of salt and a lot of flavor. Please explain how this drink can be one point. According to my WW point guide, 1 1/2 oz of vodka is 4 points and 1 cup tomato juice is 1 point. Even though you're only using 1 oz of vodka and 1/2 cup of juice, it should be higher than 1 point. @Kris - I did a nutritional analysis - and then I put it in my PointsPlus calculator. Maybe someone else could check this? Thank your for your question - I am doing my best. Thanks for calorie info. I have encountered this before, where WW "pads" the points vs. actual calorie counts. I'm in! Everything related to liquor and beer that I've read regarding WW PointsPlus points basically says that due to the fact that your body metabolizes alcohol as sugar, it does not point out traditionally. You cannot put their makeup in the calculator and get the correct amount of points. However this site (http://community.weightwatchers.com/Blogs/ViewPost.aspx?threadID=1478445) not only explains it well but gives a great formula that, while it includes more math than the calculator, gives you the points for each beverage! Hope this helps - happy tracking! Timely,I could use one this morning. My twins are graduating from high school today! Wow, how time flies by. Best summer drink ever is the Peach Bellini. Knudsen's Peach Nectar (whole foods) is 100% juice. Add 4 oz to a champagne or margarita glass (65 cal). Then add 4 oz Italian Champagne/Prosecco (35 cal). Make sure both are chilled. You can add ice if desired. 100 calories of pure summer bliss! Even better when sipped from a balcony in Assisi! 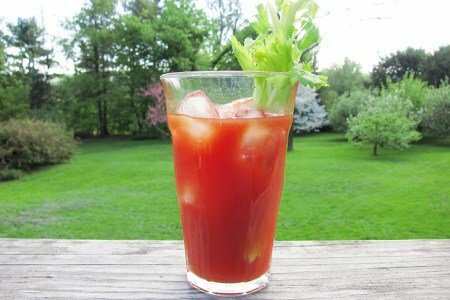 Use Clamato instead of tomato juice and it's called a CEASAR! Super delish! Here's my suggestion - Get a big Ball Jar, fill it with ice. Pour in 2 ounces of vodka (or 4 if you're going nuts). Fill about 3/4 with Vitamin Water Zero (stevia sweetened, so not creepy). Fill the rest of the way with any kind of seltzer. My absolute favorite drink!!! And only about 80-100 calories from the vodka. Next time I'm east we hook up in Brooklyn, go to Peter Luger and have a week's worth of WW in one meal, what do you say? @Stacie. I'm with you girl! 2 ounces of flavored vodka, lime, lemon, etc. added to a tall glass of iced water. Less than 100 calories. Although you all have great ideas on low cal drinks, sometimes nothing beats a bloody Mary :) thanks snack-girl! Vodka and diet Sierra Mist - bubbly and cool!! yum! Yummy, yum, yum, to all the low cal drink recipes. Hurray for Vodka! Try Spicy V8 for tomato juice!! I do not drink much (it has been 1 1/2 yrs so far, lol) BUT I saw in a magazine that they now have low calorie, less sugar added vodka.